Leader in Engineering, Robotics and Computer Programming Enrichment for Ages 4 – 14 begins its Expansion. STEM For Kids, North Carolina – USA based organization announces the launch of STEM For Kids® programs in Dubai UAE. With the global demand for STEM (science, technology, engineering and math) talent continuing to grow, early STEM enrichment is a key need. STEM For Kids® proprietary set of curricula in fields of engineering, robotics and computer programming provide a nice complement to schools’ continuing efforts to meet the STEM need. Programs are delivered to children ages 4 – 14 in partnership with schools and outside schools as in-school field trips, afterschool programs, camps and workshops. Amit Vyas, owner of the STEM For Kids Dubai franchise, is a Londoner who studied computer science and business at Aston University in Birmingham, moved to Dubai in 2005 after he saw a technology gap in the market he knew he could plug. Vyas and his organization have helped numerous companies create an online presence with robust social media, marketing and SEO. “I’m delighted that the opportunity to bring STEM for Kids to Dubai presented itself as the technology industry has hugely impacted me both personally and professionally. I’m extremely excited to be able to share these wonderful programs with future generations and hopefully play a part in their development and success” said Vyas. “Welcome Dubai! 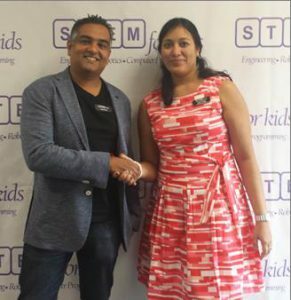 We are excited to expand our footprint and bring opportunities for young students in Dubai to explore the breadth of the wonderful world of STEM” said Moni Singh, Founder and CEO of STEM For Kids. Singh is a recognized Leader in STEM, recipient of many awards including the prestigious Triangle Business Journal Women in Business, Enterprising Women of the Year Honoree and a 40 under 40 Leader. About STEM For Kids STEM for Kids® provides educational enrichment in Robotics, Engineering and Computer Programming for children ages 4 – 14 through camps, afterschool programs, in-school field trips, workshops in schools and outside community spaces. National and international franchise opportunities are available for single and multi-units. Entrepreneurs with a passion to impact their community through education can learn more and apply at the STEM For Kids website, www.stemforkids.net/franchiseor call +1 866 991 7053. For media enquiries contact Stephanie Edwards at 919 297 8366 or at nctriangle@stemforkids.net.